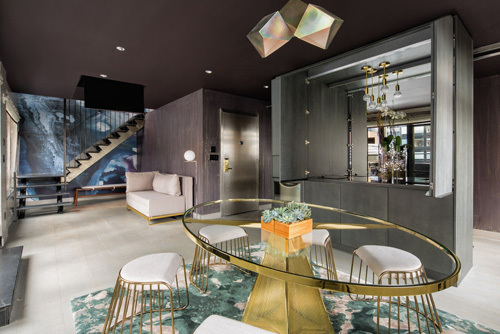 After an extensive renovation project by The Rockwell Group, the Penthouse Suite at The Time New York hotel is available for booking. The multi-million dollar redesign now provides guests the best in luxury accommodations. Offering 2,000 square feet of living space, the penthouse suite covers three separate floors of The Time New York Hotel. Near iconic Times Square at 224 W 49th Street, this Midtown Manhattan luxury hotel is convenient to the best New York City has to offer. The triplex Penthouse suite also includes an expansive, 500 square feet private terrace. Gaze out and take in the incredible Hudson River views. First opened in 1999, The Time New York hotel is popular with well known entertainers, artists and celebrities. As you enter its open lobby, there’s an enclosed bar and lounge to enjoy drinks and socialize. Enjoy a VIP experience in the Big Apple. The newly remodeled, triplex penthouse suite is luxurious from top to bottom. Enjoy lavish decor including high-end furniture and the marble bathroom with luxury amenities such as an over-sized soaking tub. You’ll find a large bedroom on the second floor with a king-size bed with Italian frette linens. Relax and unwind in the large living / dining area on the first floor. There’s a pull-out sofa, kitchenette, gourmet minibar and a stylish glass table to enjoy your in-suite meals. The suite includes complimentary wireless internet, a work desk with USB ports, secure safe, ironing board with iron, and 3 Samsung Smart TV’s. When it’s time to go to sleep, take advantage of the blackout drapes for a peaceful night’s rest. · Enjoy a late night dining delight in your suite with caviar pizza from Serafina along with a Magnum bottle of Dom Perignon Rose Champagn. Contact The Life of Luxury today to plan and book your trip to New York City and stay at The Time New York. Come back again and follow our popular luxury blog. Read about the latest luxury travel news.